SalzburgerLand is considered a choice destination for mountaineers, hikers and bikers, families and nature lovers. They all appreciate the authentic hospitality, lived traditions, safety and the unspoilt nature in all its facets. But before tourism found its way to Salzburg due to people’s growing desire to travel, the province was impoverished by wars and changes in sovereignty around 1800. Agriculture, especially in the remote valleys, secured income and survival. The cultivated land and cattle were the greatest treasures of the farmer which he respected, cared for and cherished. The imperial couple Franz Joseph I. and Elisabeth started a trend with their summer retreat trips to Bad Gastein and Zell am See. Mountain pioneers at the time found and made routes to the most beautiful peaks and built shelters. The herdsmen who of course already herded their cattle on the mountain pastures were more often visited by passing hikers. With a glass of fresh cow’s milk, a piece of bread and cheese, they showed kind hospitality and offered them a place in front of the mountain hut. The first enthusiastic mountaineers were followed by even more who wanted to satisfy their desire for the mountain experience in SalzburgerLand. The huts were leased over the years by mountain hut keepers who delight hikers with regional delicacies. Today, mountain tourism is firmly rooted in the regions of SalzburgerLand – but the tradition of mountain farming is also still well maintained, as the foundation of today’s success lies therein. In 2003, SalzburgerLand Tourism, together with the Alpine farmers in Salzburg, re-positioned the topic of hiking in order make it come alive as a unique cultural experience. An important milestone in the success story of Alpine Summer in SalzburgerLand was the opening of the Salzburger Almenweg trails in 2006 which run throughout the Pongau region, divided into 31 stages. The award winningAlpine Summer Huts guarantee a high standard of quality. Selected Alpine Summer partner businesses offer full service and attractive packages for hikers. Despite the rapid rise in tourism, the people of SalzburgerLand have never forgotten their roots. Local tradition is authentic and genuine, actively maintained and cultivated, whether it’s the cattle drive to the mountain pastures to mark the start of Alpine Summer or the descent of decorated cattle at the beginning of farmer’s autumn. 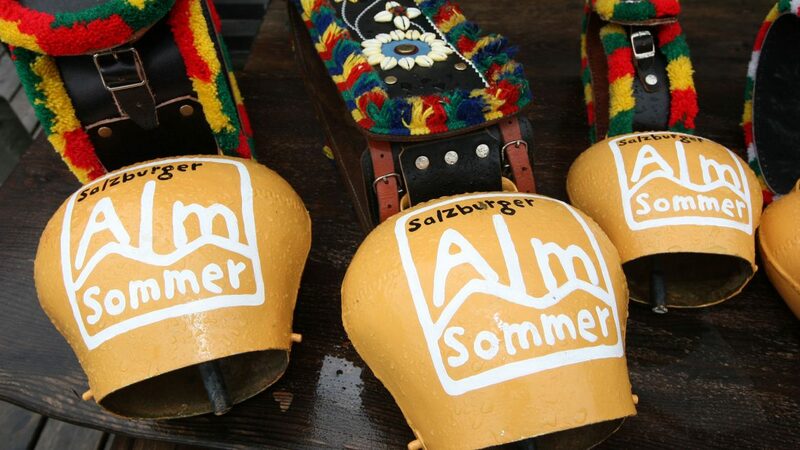 Many other traditional customs are still practiced in SalzburgerLand. Weather ringing: Many villages hear the ‘weather ringing’ once dark clouds are seen and storm is approaching. The church bells chime without a break to warn the farmers in the fields. Legend also says that the sound of sacred bells will disperse the clouds. Lighting the weather candle: A black, consecrated weather candle is still today lit at some farms to prevent their homes and farmland from lightning during a storm. Herb bundle binding: On Assumption day on August 15, 7 herbs are traditionally bound to a herb bundle. After consecration, it is dried and hung below the attic. There, it is intended to protect against lightning. If it is placed under the pillow, it should preserve marital bliss. It is even used for medicinal purposes during winter. Smoking out: The smoking of the house and stable in the rough nights is an old Christmas tradition that is still practiced in many homes. Using an incense burner, in which parts of the herb bundle may be placed, each room is smoked out. But also during other days of the year such as after an illness, smoking is practiced to clean a room. “Ranggln“: This traditional showdown of strength involving herdsmen and dairymen, similar to wrestling, still attracts locals and visitors. During Jakobiranggln on July 24 on Hundstein mountain between Maria Alm and Zell am See, the ‘Hogmoar’, winner of the competition, is determined. The Hundstoa-Ranggeln was added on UNESCO’s list of the Intangible Cultural Heritage Austria in 2010. Have we awoken your interest in Alpine stories from SalzburgerLand? In the free Alpine Summer Brochure 2018, you will find the most beautiful Alpine Summer Festivals, and everything you need to know about the Alpine Summer in SalzburgerLand 175 top-class Alpine Summer huts.